So Shay: My website! # It's here!!!! My website! # It's here!!!! I have A LOT of updating to do to it, but I have had this thing since November, and I still have yet to make it public. So here it is!!! I will be posting my recent photoshoots soon! If you are on facebook, feel free to "Like" my page. Just look up Shalyn Nelson Photography and I should pop up! ShareMy website! # It's here!!!! Too funny! I've read your blog for almost a month now and I also work at a web hosting company. When you said you have a website I just-for-kicks decided to see if it was registered/hosted with us. It is! I'm a nerd, I know, but small world! And apparently it's getting smaller because I'm from Lake Travis :) Nice to meet you! Congrats! The site looks great and such an inspiration from someone who would love to get her side photography business started as well! :) Best of luck! just found your blog! you're too cute! can't wait to read more! Woot woot! Congratulations, Shalyn! Heading on over to check it out and "Like" you on FB! Just found your blog Via "Carissa explains it all" And I love it! Actually what caught my eye was the Texas comment. I lived in Austin for a year as a nanny! My heart is still in Texas! Happy blogging! 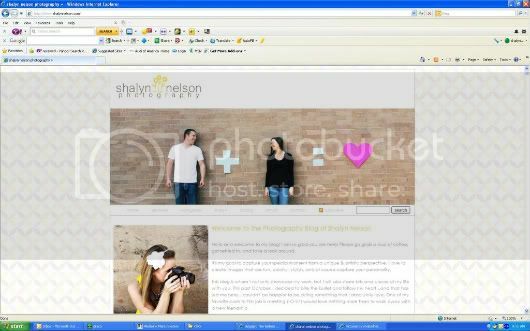 Shalyn I just looked at your website and your pictures are gorgeous!! Congratulations on listening to your heart and doing something that you love - your passion definitely shows in each and every one of those pictures. Your work is great! I am an aspiring photographer and just starting to get serious aout it! You have inspired me! :) If you don't mind me asking what camera do you use? And what camera did you start out with? Keep up the good work! Love love love it! Following...after a few miscellaneous comments. Your whole style is right up my alley. I checked out your photography site. Very nice work! We have a similar photog style. Can't wait to see more of...everything. You are amazing. Congrats girl! I love seeing people make their own dreams come true. Loving it! How exciting and FUN!!! I just saw this today, but I love it...congrats on such a fantastic photography site! Continued success with everything! Girrrrrl. I am SO IMPRESSED!! !